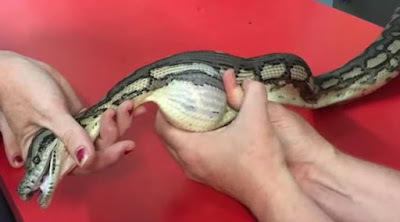 Home » Viral Posts » What inside this snake in unbelievable!!!! What inside this snake in unbelievable!!!! The snake that you are about to meet in this clip decided to bite off more than they could chew….literally. The results of this snake’s decision are absolutely priceless and have to be seen in order to be truly believed.This clip is also further proof that veterinarians are amazing and incredible people. The idea of caring for a snake might seem crazy to some, but to a veterinarian, they are simply another creature that is in need of care, although they may seem scary to someone else. Unfortunately for this poor snake, he overestimated his swallowing abilities and his attempt to consume an entire tennis ball has ended poorly. Luckily for our slithery pal, there is a qualified vet on hand to assist him in his hour of need.Our snake friend thought that this tennis ball would make for a nice meal and he certainly has another think coming. When this video opens, the snake looks to be in a serious amount of discomfort and even the most callous viewer just might decide to take pity on him.